Nine-year-old Addie and her 13-year-old brother Nathan were more than a little skeptical about their summer vacation. “Most of the time, having teachers for parents is great, but sometimes it’s just strange,” commented Nathan, remembering how he felt at the time. Their parents, Indiana school teachers Josh and Samantha Kendrick, use every day as an opportunity for teaching and learning. So, when the couple discovered that the average American family of four produces about 18 pounds of garbage every single day, they felt compelled to investigate. They weren’t sure that they, their family, students, or community could fully appreciate exactly how that trash was adding up or what could be done about it. Lucky for us, their curiosity motivated Josh, a seventh-grade teacher. He applied for and received a $12,000 Teacher Creativity Fellowship Grant from the Lilly Endowment Inc. to allow his family to travel across the country visiting national parks and collecting and measuring all of the trash they accumulated during their month-long summer vacation. Josh imagined that contrasting the beauty of the national parks to their stinky, nasty trash might provide the insight and incentive needed to create change. “I desperately wanted for us and everyone to understand the need to waste less — a lot less,” noted Josh. 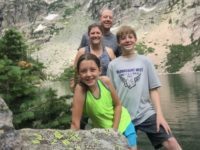 The family began their cross-country journey early last June and logged their experiences on the blog, “Travel in NO Trash.” The plan was to drive their minivan from Brownsburg, Indiana to Yosemite National Park in California and back, visiting at least 11 national parks in 31 days. All the while, they planned to experience first-hand, up close, and personal the trash they were producing during that month. For the first 10 days, they intended to keep all of their trash in the car with them. And for the final 21 days, they were going to attempt to create no waste at all — or at least as little waste as possible. Along with typical vacation gear, they packed bins to store trash and sort it into categories (recyclable, compostable, and landfill). Then, they set off. As you might imagine, not long into their journey, the bins began to fill — quickly — and the minivan started to stink. During this time, this average American family enjoyed snacks in the car, got fast food, ate at restaurants, and visited the free breakfast buffets at the hotels where they stayed. They kept all of the resulting trash: chip bags, disposable fast food cups and wrappers, empty yogurt containers, leftover food from meals, and more. The family had planned to spend the first 10 days like many vacationers, paying little or no attention to their waste. But that waste was piling up. “For most of us, we throw trash ‘away,’ but for us, ‘away’ meant the bins in the back of the minivan,” commented Samantha. Only a day or two into the trip, they realized they were going to need to cut down on their waste or they wouldn’t have space to sit or air to breathe. Even so, during those first 10 days, they accumulated and carried with them about 25 pounds of trash. On day 11, they joyously disposed of everything, placing it into compost, recycling, and landfill bins near Grand Teton National Park. For the remaining 21 days of their trip, they tried their best to go zero waste, and their efforts were successful. Using reusable plates, cups, bowls, cutlery, napkins, and containers, they managed to produce just 3 pounds of trash in 21 days! Visit their blog “Travel in NO Trash” to virtually follow their journey with photos, experiences, and informative videos as they traveled across the country visiting parks and realizing just how much waste they created and how to reduce it. For another family’s experience with zero waste, read Zero Waste Pioneers.